After getting beaten by the heat in Bangkok, I travelled north to the cooler climates of Chiang Mai. Thailand’s second city. I didn’t come here solely for the weather; in 2008, Chiang Mai University hosted the United Nations Food and Agriculture Organisation for a historic conference. 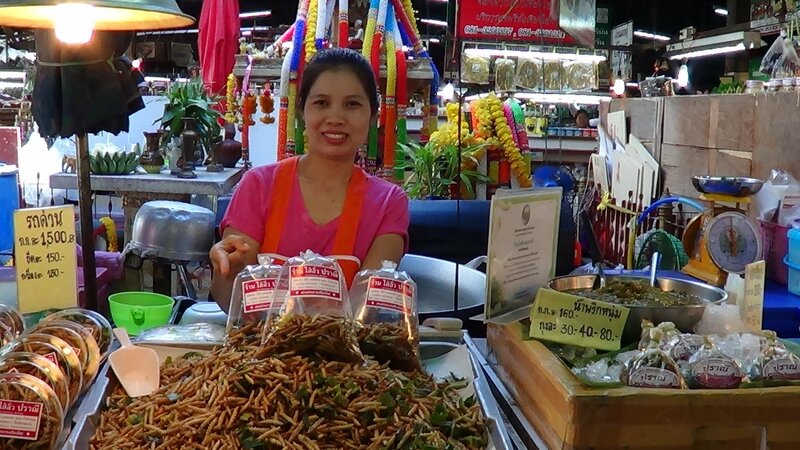 The conference’s main outcome was to hail insect farming and consumption as the most environmentally-friendly alternative source of protein for our diets. I won’t bore you with the science…yet…but simply put, the farming of insects require far less of the world’s resource – land, water and crops – than any of our staple meats (beef, chicken, pork, lamb etc), and can provide us, gram for gram, with more protein, iron and calcium than any of the above. I spent most of the day trying to find the Faculty of Agriculture. It’s a big campus and after taking many golf carts and lifts on the back of students’ mopeds (Agriculture and Architecture sound extremely similar when pronounced by Thais), I managed to find who I was looking for: Dr. Jiraporn Kulsarin. The Head of the Entomology Department (study of insects) and expert of entomophogy (the practice of eating insects). So an hour later, and several failed attempts to practice my poor Thai, she takes me to Tom Pa Yon street market to try ‘Non rot duan’. I didn’t really know what to expect because in our conversation she said they can be eaten straight from the bamboo, live, or fried. The purist in me was hoping for the former and felt a little sad when I saw the stand she was taking me to: Fried food heaven. That was the literal translation. I take some photos and buy a bag. She says follow me. Strangely enough, she is a real talker, except for when she walks and doesn’t say a word. We go to a local restaurant and order some chilli soup. She opens the bag and we start dipping in. It’s not clear from the photo but some are lighter in colour and these are the more tasty ones. The darker the more fried, and again the bacon like taste. 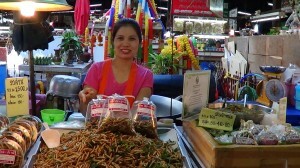 She says this is because most fried food in Thailand is cooked using re and re and refried oil. That explains a lot. She cooks them at home with sesame oil. The lighter ones have a sweet honey flavour to them and she puts the sweetness down to their bamboo shelter. After eating a few from the bag, she pours out a healthy portion into our soups. They soak up the fish oil and chilli and it turns out to be a delicious lunch. I see a look of relief on her face. Like when you share a song you love (but probably shouldn’t) and see you are not the only one. Only one week into The Grub Trail and this was just a taste of what’s to come.